Akai has always been at the forefront of music prodctuon technology. Consistently flooding the scene with high quality products that are made to stay truly have become a staple in any serious music producers closet of gear. Dr.Dre for example used to create entire tracks using 4 or 5 different MPC 2000XL’s all in unison. Akai isn’t done yet, and is most likely getting started getting in touch with the new wave of millennia’s that are interested in creating music with their newest addition to their famous MPC series in 2015. 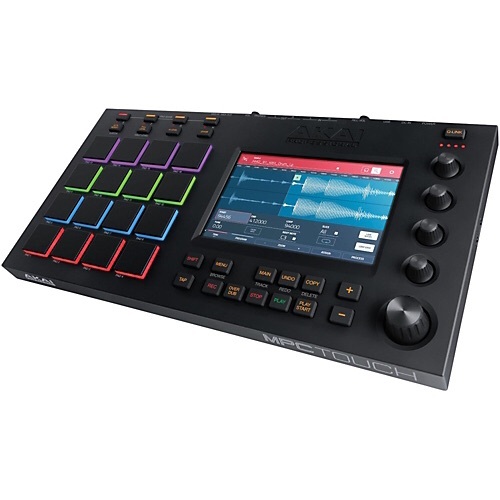 You can buy the new MPC Touch exclusively from Amazon and get it shipped Prime. If you’re anything like me you hate waiting by the mailbox for new gear. Featuring an onboard piano roll, 16-track real time quantization, XYZ finger mapping to control effects, easy to navigate libraries that come stock with 20,000 different sounds from tons of Akai’s affiliates, from what we can see in the pictures the new MPC has no MIDI i/o meaning that they could be releasing a new standalone software with the newest release, making it a direct competitor with Native Instruments Maschine. Given that the Akai team was seen at the latest Windows convention, it’s safe to say that they have been getting more and more involved on the software instead of hardware this year. MSRP is set at $799 for it’s release, may be subject to change.